Image caption Oliver Letwin said looking at people's behaviour was an "undeveloped field"
There is "little information" to show that the law against murder is working as a deterrent, coalition policy chief Oliver Letwin has said. But that does not mean governments should repeal it, he told peers. A Lords committee is investigating a government initiative to change people's behaviour without new laws. Mr Letwin admitted there was no evidence that "nudge" theory, developed in the US, worked. But he claimed it did not cost anything to try it. The Cabinet Office minister told peers a team of six experts in Downing Street was looking specifically at increasing organ donation rates, cutting smoking, improving car labelling to make drivers more energy-efficient, raising food hygiene standards and encouraging people to give more to charity by "rounding up to the pound" with their donations. 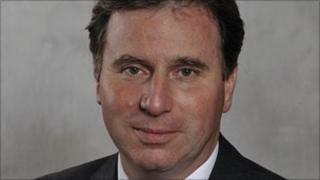 Mr Letwin, a Conservative MP, said: "It's open to question whether any of this will have any effect whatsoever... But it's extremely clear that it's pretty cost-free to do these things. If they don't give us the results, we won't have lost much." The "nudge" approach argues that bad choices and laziness are a large part of what makes people human and instead of appealing to voters' self-interest, politicians must help to make personal and socially beneficial choices "easier". Examples include automatically enrolling employees in savings schemes, with the option to opt out, or school canteens putting healthy food at the front of the counter to "nudge kids towards good diets". Ministers have established a "behavioural insight" team in the Cabinet Office, under Mr Letwin's leadership, to co-ordinate work in this area and the Lords science and technology sub-committee is scrutinising its effectiveness. During the committee session, Lord Krebs, an independent peer and Oxford academic, said: "I think it's fair to summarise the expert views that we have heard that nudging, in the sense of not having compulsion or taxation, on its own does not work... Is it that you have different experts giving you different advice?" Mr Letwin replied: "Yes, we do have clearly different experts, some who believe it will, in fact, work. Experts are pretty thick on the ground and none of us truly knows at the moment whether regulation works... This is a fairly undeveloped field altogether." Lord Krebs argued: "It's not cost-free to try something that, according to expert views, is likely to fail." As the discussion developed, Mr Letwin expanded on the theme by questioning how effective government regulation and compulsion had been in altering people's behaviour. He said: "There's very little information about what's really achieved by things like the law against murder, which has been going on for really quite a number of years. "How effective is the law against murder? Nobody's going to try the experiment of the counter-factual of removing the law against murder. "It's extremely difficult to determine how effective the law against murder is. That's the most fundamental law, I suppose, that a society has. "Amongst many, many others we have no knowledge whatsoever, in a serious scientific sense, of their effects." Mr Letwin said he hoped that, in a few years' time, there would be "elaborate" evidence on the effectiveness of nudge theory. He told the peers: "So what we are doing is beginning a journey to finding things out to make us better and make subsequent governments better able to legislate rationally."